GERMANY: Siemens is extending its direct-drive onshore turbine range with the introduction of three new 3MW models. Based on the SWT-3.3-130 platform launched two years ago, the three models share the same nacelle design. Different rotor diameters, generators and controller settings allow for applications in low-wind, medium-wind and noise-sensitive sites. The SWT-3.3-130LN is the low-noise offering, featuring a reduced rotor speed and aerodynamic add-ons for the B63 blades. Vortex generators are applied to the blade backs, while the trailing edges are equipped with a combination of serrations and combs, a device that reduces operational noise. On day one of the WindEnergy Hamburg exhibition, Siemens unveiled a new generation of its aerodynamic blade add-on, the DinoTail. Inspired by the trailing edge of an owl's wing, the device reduces operational noise. "In our wind tunnel measurements and field tests, the combed teeth showed a substantial reduction in wind turbine noise at all wind speeds," said Siemens. The SWT-3.6-130 has an uprated generator, which Siemens claims improves annual energy production by 6% over the 3.3MW model. It is aimed at medium-wind IEC ll sites. Like the low-noise turbine, it is set for serial production early next year. The SWT-3.15-142 is the first direct-drive turbine Siemens has aimed at the low-wind IEC lll sector. 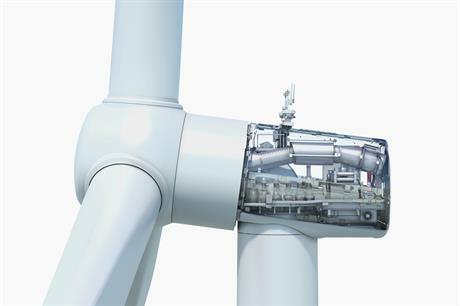 Danish firm LM Wind Power provided the hybrid-carbon technology for the 69-metre blades. It will be available with towers for hub heights of up to 165 metres. Series production will start in late 2017. "Our new wind turbine portfolio is the result of an intelligent platform strategy that allows maximum flexibility," said Siemens onshore chief Thomas Richterich. "Our customers benefit from the adaptability of our technology that meets nearly every site-, grid- and project-specific requirement. Thanks to digitalisation, these turbines are open for further optimisation and individualisation."